Here at the farm we have a heat wave in March. Its 80°F outside today March 10th. Usually its in the 50’s at most. I usually consider March to be the month for ice storms and certainly lots of icy weather. Not 80°F! The poor plants don’t know what to do. Some are coming up like crazy. The winter aconites and snowdrops have been flowering for about two weeks now. The daffodils are up with buds on them (well some are, depending on the variety). The maple trees are flowering and a few insects are around to service them, but not as many as would be around next month when they usually flower. This kind of weather really screws up spring cleanup work. It’s fine to prune vines, shrubs and cut out trees when its in the 50’s and low 60’s but its too hot to do such work in the 80’s. That’s not because they cant be pruned its because a lot of ours have thorns and prickles and you need long pants and sleeves, which is pretty unpleasant at 80°! Cutting down trees and dragging them to the wood racks or into the chipper is also a job for long pants, thick gloves and boots. Not at 80°. So spring cleanup is at present relegated to cleaning out dead perennial stalks and pulling up annuals from last years crop. Still its supposed to be back in the 60’s at the weekend then the real tough spring work can begin again in earnest. The main problem for gardeners and plants is that warm weather encourages plants to grow, then cool weather moves in and cuts down the tender shoots. This can mean no flowers on the trees and early blooming shrubs. Perennials can have their early vegetative growth killed off. Most perennials usually recover but some may not. 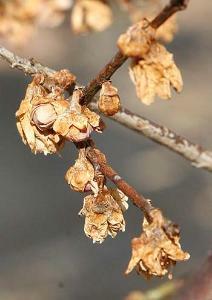 Flowering trees may produce no flowers this year just have sad withered husks of flowers that never were. Sadly there is not much you can do for the trees and shrubs. If you have semi tender perennials coming up and the weather is going to turn cold again mulch around the plants covering up the new green shoots to protect them. Using leaves from last years fall is an excellent insulator. If not shredded newspaper works well too. Just make sure you take it up again when the real spring arrives. Next Next post: Saturday I Picked Up Sticks.